Trinmar workers faced a potential safety issue their when boarding offshore platforms. The platforms had chain link ladders that the workers used to disembark the service boats and transport tools to the platforms. H.J. 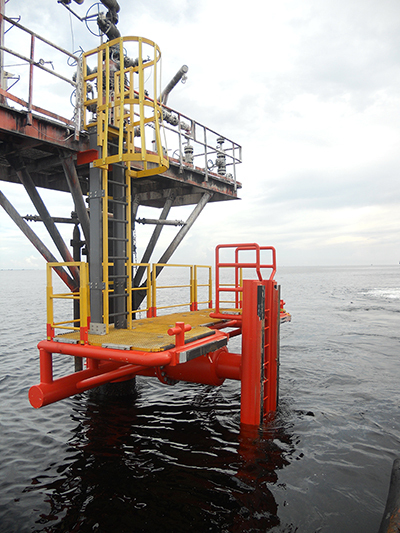 Stauble was tasked with surveying the platforms and fabricating a solutions to allow the Trinmar workers to disembark the service boats and safely transport tools and equipment to the offshore platforms. The solution was the fabrication and construction of several specialised shock-absorbing offshore boat landings that allow the service boats to dock safely along side the landing platform. These specialised landings also allow workers to disembark safely while wearing their tool belts or carrying specialised equipment. The old chain link ladders were replaced with steel ladders with safety cages ensuring the protection of the Trinmar workers going about their duties.